Standard equipment includes 16-inch steel wheels and halogen headlights, all-wheel drive is optional. Тhe vehicle is based on the original platform of the Tiguan and will be offered with only one trim level. Standard equipment includes front-wheel drive, 16-inch steel wheels, halogen headlights, cloth seating upholstery, infotainment system with Bluetooth connectivity, and a rearview camera. Optionally available will be а 4Motion all-wheel drive system ($1,975), and a Wheel Package ($495) that adds 17-inch aluminum-alloys. The 2017 Tiguan Limited will be powered exclusively by a 2.0-liter TSI turbo gasoline engine producing 200 horsepower (149 kilowatts) and 207 pound-feet (281 Newton-meters) of torque. The EPA-estimated fuel economy stands at 20 miles per gallon city and 24 mpg highway. Last year Volkswagen managed to sell about 43,000 copies of the old Tiguan, just before the new model arrived. According to previous reports, the company will sell the Tiguan Limited for two more years, but the SUV won’t benefit from the newly-announced six-year/72,000-mile bumper-to-bumper warranty for the new Tiguan and the Atlas SUVs. For a comparison, the all-new second generation Tiguan starts at $25,680 and a total of eight trim levels are available. The range-topping SEL 4Motion model costs at least $37,340, making it more than $15,000 more expensive than the Tiguan Limited. For that price, customers get a vehicle based on a new platform, featuring an array of safety and assist systems, and cool features like Volkswagen’s Digital Cockpit. Check out the press release section below for more info about the 2017 Tiguan Limited. Herndon, VA (August 18, 2017) – Arriving in showrooms soon, the 2017 Tiguan Limited is based off the original platform and reconfigures the offer structure for low complexity and high value in the compact SUV space. The 2017 Tiguan Limited is offered in one trim with an MSRP of $21,995 and is fitted with 16-inch steel wheels, halogen headlights, cloth seating surfaces and door inserts, Composition Color infotainment system with Bluetooth® for compatible devices, and a rearview camera. Destination is $865, 4Motion all-wheel drive can be added for $1,975, and a Wheel Package ($495) adds 17-inch aluminum-alloy wheels. The Premium Package ($1,295) adds Volkswagen’s Composition Media infotainment system, which has a 6.33-inch screen and USB and VW Car-Net® App-Connect technologies for compatible devices, supporting integration with three available connected car systems: Apple CarPlay™, Android Auto™ and MirrorLink®. The Composition Media system also includes HD radio, one SD card slot, the ability to sync two phones simultaneously, and a three-month trial to Sirius XM® Satellite Radio. Other features in the Premium Package include cruise control, leather multifunction steering wheel, KESSY® keyless access with push-button start, cargo cover, and roof rails. The 2017 Volkswagen Tiguan Limited combines the style and sophistication of a sporty, urban compact SUV that caters to an active lifestyle. At 174.3 inches nose-to-tail, 71.2 inches wide and 66.3 inches tall, it’s the perfect size for city dwelling or country living. In profile, the 2017 Tiguan Limited is distinguished by its raked-back windscreen, rising waistline, large side windows, and an unmistakable, trademark C-pillar at the rear. It rides on 16-inch steel wheels—models equipped with the optional Wheel Package add 17-inch aluminum-alloy “Philadelphia” wheels. Engineered to accommodate available 4Motion® all-wheel drive, the Tiguan Limited’s design reflects its ability to handle a variety of terrain and weather conditions. The squared-off wheelarches feature plastic surrounds to help protect the paintwork, while the short overhang at the front allows a 28-degree approach angle. The 2017 Tiguan Limited features spacious seating for five adults, easy step-in through the wide-opening doors, and generous legroom and headroom. But the versatility of the Tiguan Limited seating sets it apart and makes it the perfect lifestyle vehicle. The rear seat has a 40/20/40 split to fit an owner’s load-carrying needs. Fold down the wide center section and it can accommodate long items, while still having space for passengers on either side. 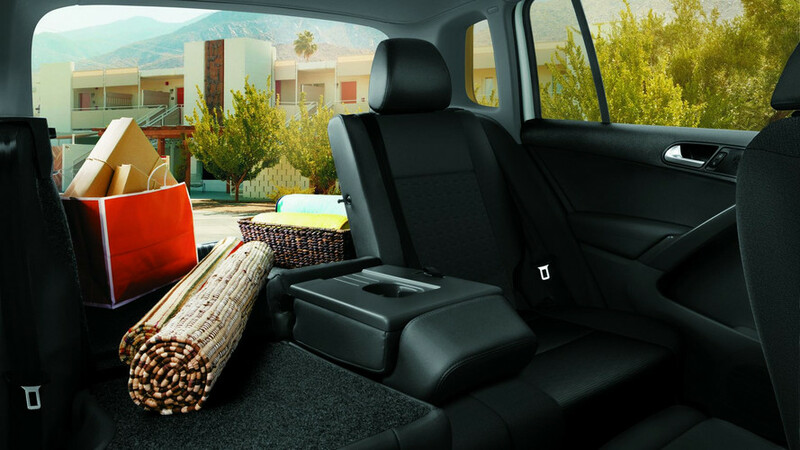 With the rear seats in place, there is still an impressive 23.8 cubic feet of space in the load area. Fold the second row seats forward and it increases to 56.1 cubic feet. And for the ultimate in cargo space, the available folding front passenger seatback can fold forward and flat to accommodate loads up to 98 inches long. The rear seats can also slide forward six inches to help increase luggage space in the back, and for a little extra comfort on road trips, each of the rear seatbacks can be adjusted. The high-lifting rear door can be opened wide to accommodate large objects. In the cargo area, there are tie-down hooks to help keep things in place and a 12-volt outlet to power coolers or air pumps. The interior features rich, soft-touch plastics on the fascia and crisp, Anthracite Metallic trim. 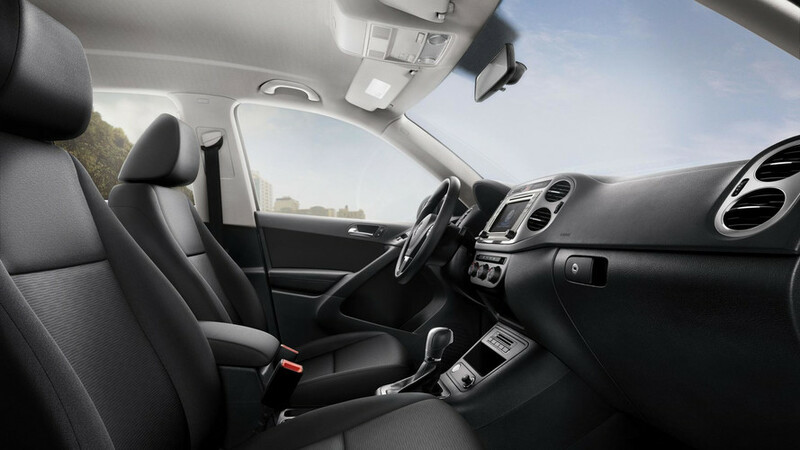 The Tiguan Limited offers cloth seating surfaces in Charcoal Black material. MIB II Infotainment. As standard equipment on the Tiguan Limited, the MIB II infotainment system not only creates the foundation for the next generation of Volkswagen’s Car-Net connected vehicle services platform, but also offers one of the most comprehensive suites of connected vehicle services and features available in the automotive industry today. 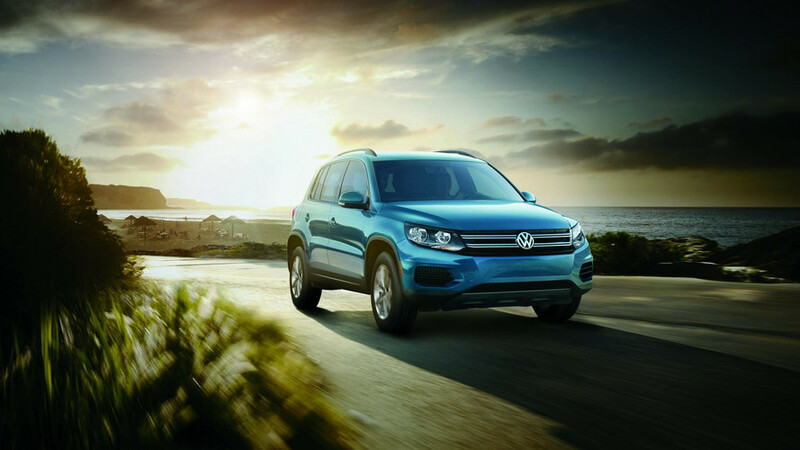 Tiguan Limited models are equipped with the Composition Color unit, which features a 5-inch touchscreen display. The infotainment system also offers SD card and USB (one port) multimedia interfaces, as well as a rearview camera and standard Bluetooth technology for compatible devices. Models equipped with the Premium Package add a Composition Media unit with a 6.33-inch capacitive touchscreen display. It features one USB port, SiriusXM Satellite Radio for a three month trial period, HD Radio, and support for lossless audio file format (Free Lossless Audio Codec FLAC). Composition Media units also have the ability to send and receive SMS text messages with Bluetooth with compatible phones and pair two phones simultaneously. VW Car-Net App-Connect smartphone integration for compatible devices is available on Tiguan Limited models equipped with the Premium Package. App-Connect offers users the ability to run select smartphone apps directly on the vehicle’s display through Apple CarPlay™, Android Auto™ and MirrorLink®. The 2017 Tiguan Limited comes with Volkswagen’s 2.0-liter TSI® turbocharged four-cylinder engine. This technically-sophisticated powertrain features double overhead camshafts, four valves per cylinder, direct fuel injection, and variable intake timing. Turbocharged and intercooled, the compact four-cylinder engine produces an impressive 200 horsepower and 207 lb-ft of torque from just 1,700 rpm (achieved on premium fuel). 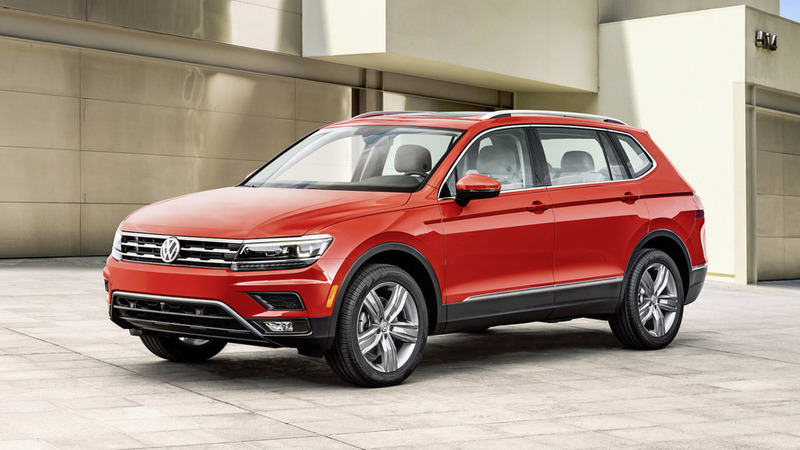 2017 Tiguan models have an EPA-estimated fuel economy of 20 mpg city and 24 mpg highway. To help provide added traction in 2017 Tiguan Limited models, the available Volkswagen 4Motion all-wheel-drive system is offered on all trims. The electro-hydraulic system delivers drive to all four wheels without any buttons to press or levers to pull. The center differential can continuously vary the drive force between the front and rear axles, depending on the traction available. Mounted in a lightweight, one-piece aluminum subframe, the Tiguan Limited’s strut-type front suspension has lower control arms and long-travel coil springs. At the rear, the robust four-link system was designed to cope with the rigors of a variety of terrains and to accommodate the available 4Motion all-wheel drive. Electro-mechanical power steering with variable assistance contributes to the Tiguan Limited’s fun-to-drive character. At highway speeds, the steering becomes firm and direct, while at parking speeds, assistance is increased. 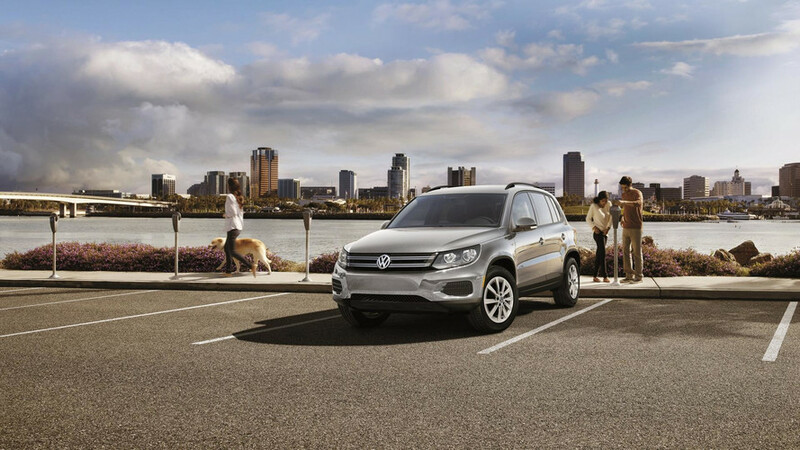 Between curbs, the Tiguan has a turning radius of 39 feet with 2.7 turns lock to lock. An impressive braking system matches the Tiguan Limited’s athletic performance. At the front there are 12.3-inch vented discs, with 11.3-inch solid discs at the rear. The system features a brake disc drying feature to help remove water from the rotors to optimize wet-weather braking, as well as Electronic Brake-pressure Distribution (EBD), and Hydraulic Brake Assist (HBA). All Tiguan models also feature an electronic parking brake. 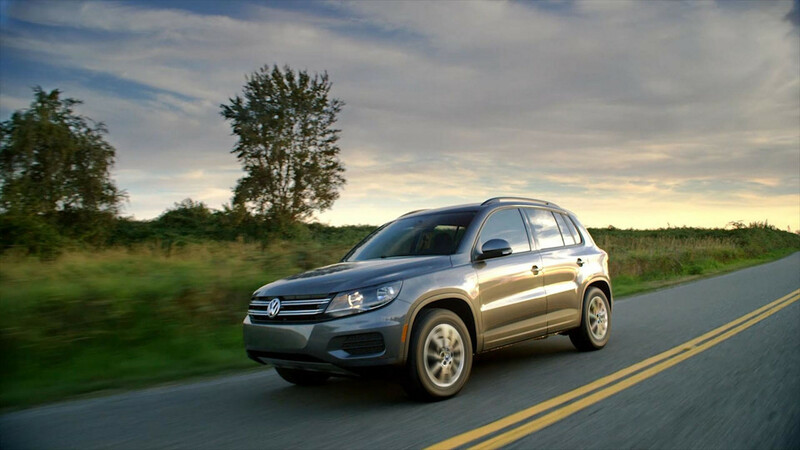 To help protect occupants, the Tiguan Limited provides a combination of both passive and active safety systems. The Tiguan Limited has been engineered to meet or exceed all current crash regulations and features six airbags as standard along with a number of electronic and mechanical safety systems, including standard Electronic Stability Control (ESC).